Lauren Hutton has been in the modeling business for more than 40 years, giving her ample time to pick up a few beauty tricks along the way. 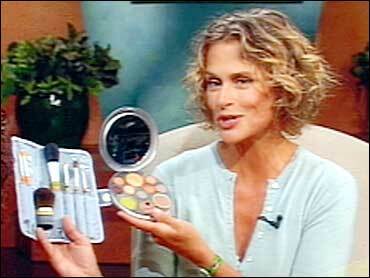 She has put her knowledge to use by creating a new makeup line called "Lauren Hutton's Good Stuff," designed for women over 35. Hutton explained on The Early Show, "This makeup's really about moving light and shadow. I was a dark horse in the modeling business. I was short, my face was uneven; it wasn't harmonious. And in the '60s, we learned how to do our own makeup. We didn't have makeup men. And in the '70s, '80s and '90s I worked with the best makeup men from all over the world so I learned a lot of tricks. And she said she realized, after going back to modeling at age 46, that most makeup is developed for younger faces. It doesn't correctly block shadows but rather draws light and attention to older women's flaws, such as wrinkles. "We start with shadows under our eyes. Now suddenly our skin thins around the eyes so shadows start on the side of the nose. The bone shows through and makes your eyes look closer together," she explained. Her new makeup line includes an instructional video, which comes free with each makeup disk. It shows, as she makes up her own face, how easy it is to use her line. "Good Stuff" is available in 4 different color palettes - pink, yellow, olive and brown. She said, "If you don't want to look like you're wearing makeup, this is for you. Even men can wear it!" She color-coded the brushes and the makeup to streamline the process of applying makeup. "I was always a believer in 'as little time as possible,'" she said. She never did enjoy sitting for three hours as someone applied her makeup. She also pays attention to the brushes she uses. But looking your best does not mean striving to be a skinny model. The very outspoken Hutton said it is a crime to see young girls vomiting to look a certain way. "They're in high school, feeling they can only look this way. And every single one of us has a different physiology. It depends where we came from in the world and our genetic background. I have been all around the world probably 35 times. And we're beautiful everywhere," she said.